Broccoli has been a part of the European and Mediterranean diet since the 6th Century BC. It didn’t make a significant appearance in the Americas until the early 20th century. Today, the largest cultivator of broccoli in the world is now China, followed by India. Broccoli has become a very common food all over the world, particularly in Europe, America, and Australia. Broccoli has antioxidants know to be able to help the body in a variety of ways. Broccoli is a wonderful source of vitamin C which is a great way to boost the body’s immune system. Also found in broccoli are flavonoids which can help to recycle the vitamin C in an efficient manner. This green superfood is enriched with carotenoids, lutein, beta-carotene and zeaxanthin. Broccoli contains sulforaphane which has great anti-inflammatory properties. Research is suggesting that it may be able to prevent or even reverse some of the damage to blood vessel linings that can be caused by inflammation due to chronic blood sugar problems. Broccoli contains fibers, fatty acids and vitamins that help regulate blood pressure in the body. This also helps in reducing bad cholesterol, hence leading to a healthy heart. Broccoli helps to protect blood vessels from damage as well. Broccoli is high in fiber, therefore, it can help to rid the body of toxins through the digestive tract. Plus, contains many antioxidants that are known to help the body with its detox process. What this means is the antioxidants have the ability to aid the body in getting rid of unwanted contaminants. Broccoli also contains isothiocyanates, which help in the detox process at the genetic level. Research has shown that vitamin K is an essential nutrient needed for blood clotting but many believe it may also play an important role in keeping our bones healthy and strong. Promising results from studies in the U.K. have suggested that the vitamin K found in broccoli can improve overall bone health as well as increase bone mineral density and reduce fracture rates in those suffering from osteoporosis. Broccoli is a rich in beta-carotene which the body converts to vitamin A. Studies have shown that night blindness is associated with a deficiency of vitamin A. Plus recent studies have found that the carotenoids called lutein and zeaxanthin have been linked to a decrease in age-related eye disorders like cataracts and macular degeneration. 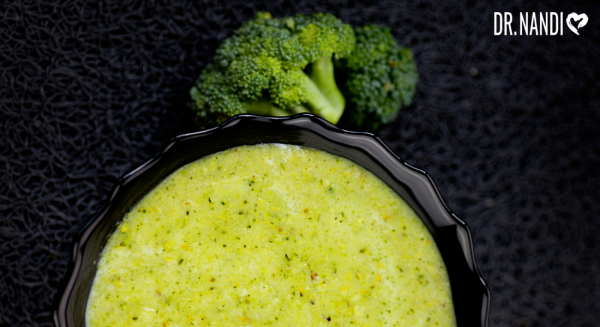 Try this new delicious Ginger Broccoli Soup recipe brought to you by Dr. Nandi! This soup is the perfect way to incorporate tons of #HealthHero ingredients into your diet.